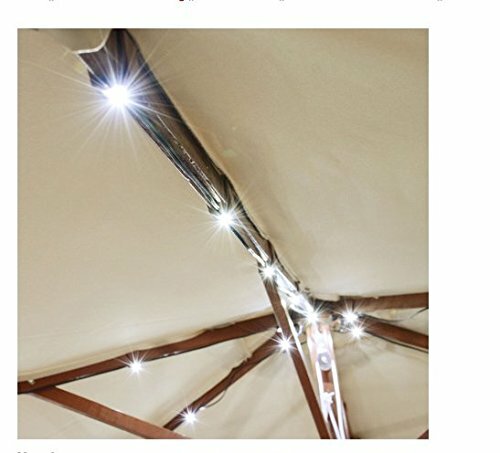 Great LED Solar String Lights fit for our 8/9ft 8-rib Outdoor Patio Wood Umbrellas perfectly. Make your outdoor look beautiful in a very economical way. Enjoy the summer nights outside with your family and friends. These sting lights create a romantic ambiance which is great when you and your loved one want to spend some time outdoors. Create romantic ambiance and ample warm lighting for outdoor patio & table umbrellas. Easy to use, safer than candles. If you have any questions about this product by AV Prime Inc., contact us by completing and submitting the form below. If you are looking for a specif part number, please include it with your message.